Last week my friend, Kate, called to say she saw a flower off in the woods and thought it was something special. It sure was! A Swamp-Lily! Also known as String-Lily, Crinum americanum L.
A few days later, I was able to go take a look at it. The weather was threatening but, I did manage to make an ink sketch of it in my journal. Then it started to sprinkle so I took a photograph, and off the the shelter of my car I went! I painted the ink drawing from my reference photo. I was a bit dismayed, as I didn't leave much room for the flower names......... ah well. I really like how you've set it off against the dark background. Beautiful! Pam this is beautiful! Love your art. 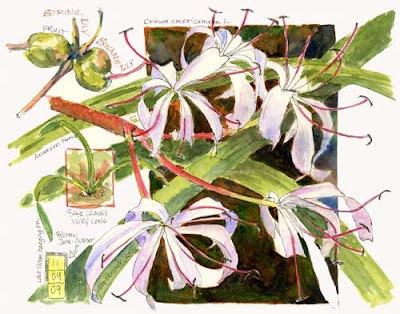 Lovely lilies and great sketch. I am so happy I found your blog--will keep coming back! Thanks for stopping by Appalachian Lady! Happy you found my blog! A pleasingly complex design! If I recall correctly one of the most complex I've seen of yours. Thank your for your comment on my blog today. Always such a treat to hear from you. I had treatment today with an IV drip of steroids. So I am a little high and hyper from the drugs. Forgive my chatty nature. Yes, this is a little departure from your usual sketches. But the black so enhances the work and the fact you did most of it in the car is astounding. I do miss your lettering and wish I could see the whole thing bigger in greater detail. I still print out your drawings for my binder of Pam Field guide drawings. I hope to feel good enough when the steroids wear off to send out thank you notes to all the ATCs friends who sent me the cards in the Halloween flags. That is one reason I wanted your crab cards. I wanted to share your art with them. The problem is that these new treatments just do me in and are once a week for three weeks in a row. Consequently these thank you notes may take a long time. Several of my other blogging friends are cat lovers, so they will get your wonderful Cat cards. I am much the cat lover too. My first memorable pet was a cat when I was about 9 years old…a cat I named Minipearl. She was a terrific pet. I so appreciate the special goodies and the wonderful handmade bag will now become my new doctor’s office art supply bag. Is that silk-screened? Now I will think of you and get inspired at every doctor visit. So that will be a lot. On steroids is about the only time I paint now. They make my hands and brain pop back to life for a day or two.